Luwanda Jenkins has over 25 years of results-driven experience in the areas of government relations, small and minority business enterprise program development, and corporate social responsibility. Luwanda was a Democratic candidate for Lt. Governor and running mate to State Senator Richard Madaleno (D-Montgomery County) in the 2018 Maryland gubernatorial primary. With a background that brings an unparalleled breadth of experience in the public and private sectors, Luwanda has served in various state government positions and administrations including a cabinet-level secretary in the O’Malley Administration; the President’s Office at Coppin State University; the Greater Baltimore Committee LEADERship program, The Cordish Companies, CareFirst BlueCross BlueShield and The Baltimore Sun. 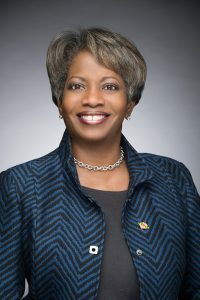 She is known best for her leadership and advocacy on behalf of Maryland’s small, minority and women owned businesses, and is credited for achieving key policy advances and record gains for diverse participation in state contracting and procurement activity during her service as Special Secretary of the Governor’s Office of Minority Affairs under Governor O’Malley. In addition to her work in the public sector, and the executive branch of state government, Luwanda has an impressive track record for leading high impact corporate social responsibility initiatives including, The Baltimore Sun’sReading by 9 program (1993-2003), a nationally recognized children’s literacy program credited for advancing education reading instruction policy in Maryland. While serving as Director of Community Relations for CareFirst BlueCross Blue Shield (2003-2007) Luwanda managed the company’s $6 million charitable contributions program throughout Maryland and DC at a time when the obesity epidemic, chronic diseases and health disparities among minorities and underserved populations were on the rise. Luwanda was instrumental in facilitating strategic partnerships with trusted, community-based health organizations to achieve mutually beneficial outcomes for CareFirst’s members, and the communities served by the region’s largest health insurer. As Vice President-Community Relations & Diversity for the Cordish Companies (2015-2017), Luwanda established community benefit agreements on behalf of the Maryland-based global real estate development company and government officials in communities where Cordish was negotiating for multimillion development deals utilizing taxing incentives and other government assets in cities across the United States. Considered innovative and comprehensive for the level of inclusion and local community input from stakeholders, Luwanda’s reputation as a collaborative leader provided an important element to several best-in-class development projects in the Cordish Company portfolio. As an extension of her professional activities, Luwanda is passionate about advancing leadership opportunities for women and college access and affordability and devotes her time to supporting these important issues.